Starting in student days, I’ve performed or heard the Stravinsky Mass in highly varied circumstances. One memorable occasion fell on a cold, wet English January Sunday. The choir of King’s College, Cambridge sang it at the morning service, with a congregation that was outnumbered by the choir and instrumentalists. Another unforgettable hearing also occurred in that country (where it is far more likely to be found as part of the liturgical repertory than here in America), at a regular Saturday-morning Mass at Westminster Cathedral. In this case it was accompanied — to surprisingly good effect — by the organ in the apse. 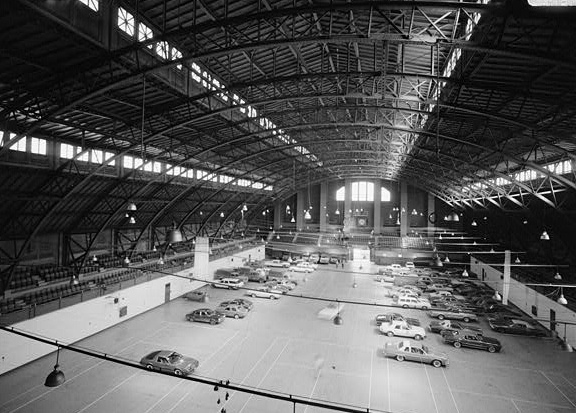 But in the extreme resonance and utilitarian architecture of the late-19th-century armory on Park Avenue? The old-society WASPs of the Seventh Regiment would have stared, but last night was an important and liberating night for New York music, in a place whose previous concert events lie far back in another century. The start of the concert was held up for a while as a goodly portion of the audience stood in front of the building to see Pope Benedict drive by, and this was only a foretaste of how unfamiliar this event would feel to a regular local concert-goer. I have written here before about the imaginative use of different venues by George Steel’s Miller Theatre, and my imagination is still running wild as a result of their concert last night of sacred music by Stravinsky. Trying out three different areas in the fraction of the vast space that the performers and audience occupied, I found the acoustical issues challenging but not insuperable. The performances were wonderful and profited by being freed from the conventional conditions of a concert hall. Future events — many of a sort that cannot yet have been even dreamed of — will tell us what the space can do for us musically. The building, now to be known as the Park Avenue Armory, could become a wonderland for creative types. I know I had some pretty wild thoughts last night: for example, what if some large Romantic organ of the type that lived in Paris’s old Trocadéro could be installed at one end? Could it be an opportunity for restoration of secular use of such pipes to our musical life? Stranger things have happened.